LOS ANGELES—Political theatre is bustin’ out all over the place these days. The dramatic emergence of new authoritarian movements around the world, and just as surely the radical possibilities opened up by the global Resistance, offer rich fodder for artistic response. It’s hard these days to have a conversation about almost anything without the current conditions affecting our thinking. 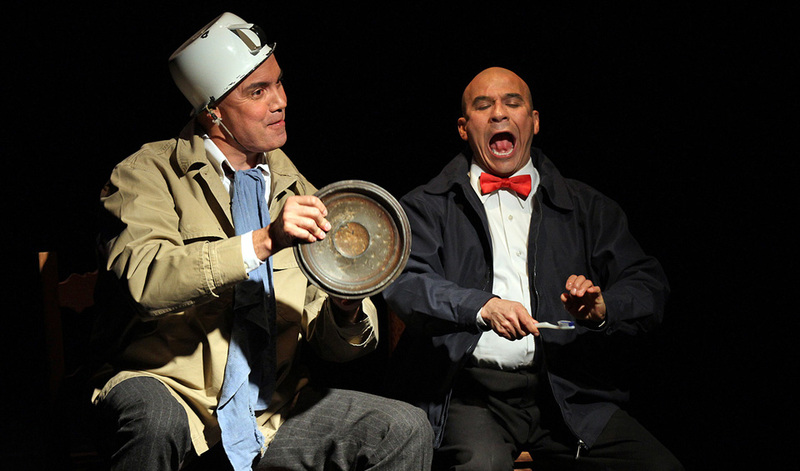 The spunky 24th Street Theatre has brought back one of its highly successful ventures from 2010, the award-winning two-character play La Razón Blindada (“Armored Reason”). It’s the company’s 20th season, which they’ve themed “Speaking Up/Standing Up.” Next March and April they’re presenting a world premiere play ICE about immigration and what it means to be American. And in between, a Day of the Dead event, a weekend of community-based theatre, and a holiday production. This heartrending exaltation of the human mind under duress emerges from the brain of Argentine playwright Arístides Vargas, who also directs. Vargas derived some of his inspiration from testimonies from his brother Chicho Vargas and other political prisoners held in Rawson Prison during Argentina’s “Dirty War” of the 1970s under President Jorge Videla (later convicted of crimes against humanity, disappearances, torture and murder). Vargas learned that the Rawson Prison inmates did just that for themselves. A common denominator for all educated Latin Americans is the classic Spanish novel Don Quixote by Miguel de Cervantes Saavedra, published in two volumes in 1605 and 1615. Don Quixote is considered the most influential work of literature from the entire Spanish literary canon, and among the world’s best-known literary achievements. The novel’s complete title is El ingenioso hidalgo Don Quijote de la Mancha, which lends additional layering to the political prisoner context of the play. “Ingenioso”means “ingenious,” but also “witty,” “talented,” or “clever,” and these are the qualities of storytelling invention that the playwright summons forth in his two characters, De La Mancha (Jesús Castaños-Chima) and Panza (Tony Durán). Who are also “hidalgos” of a sort—not noblemen by birth but high-minded “sons of something”—the original meaning of “hidalgo”—in their profession of democracy against Argentina’s or any country’s dictatorship. Even the idea of “La Mancha” is exploited in the scenography—it refers to the dry but fertile plateau of central Spain, south of Madrid, as in the well-known musical Man of La Mancha. Projections during the play locate the setting in isolated Patagonia, where the maximum security Rawson Prison stands, far from Argentina’s urban centers and cut off from visitors. A third source for Vargas’s play is “The Truth About Sancho Panza” by Franz Kafka, a short story published after Kafka’s death, which posits that Quixote’s sidekick and manservant Sancho Panza was the true storyteller in the relationship between the two men, the author and creator of Don Quixote the character. It is certainly true that in the play the Panza character bears fully equal weight with his co-prisoner, and perhaps could be considered the funnier, earthier and more perceptive of the two. His peroration on “man’s best friend”—the dog—is worth the price of admission alone, though I guess I should properly, bilingually, call it perro-ration. Not surprisingly, this production, originally developed while Vargas was in exile in Ecuador, has traveled around the U.S. as well as to several cities in Mexico, El Salvador, Colombia and Ecuador. The musical accompaniment is particularly effective, capturing the elusive nature of this almost dreamlike narrative: It’s Gabriel Fauré’s evocative Elegy, opus 24, originally for cello and piano. Was Vargas aware that the 1901 world premiere of the orchestral version featured Pablo Casals as the soloist, the preeminent musician who refused to visit or perform in his native Spain so long as the fascist Generalísimo Francisco Franco remained in power? La Razón Blindada has just a few remaining performances at the 24th Street Theatre: Sat., Oct. 14 at 3 pm and 7:30 pm, and Sun., Oct. 15 at 3 pm, at the 24th Street Theatre, 1117 W. 24th St. (at Hoover Ave.), Los Angeles 90007. For tickets call (213) 745-6516 or go to www.24thstreet.org. The play will be restaged for 5 performances during Encuentro de las Américas, an international theatre festival at the L.A. Theatre Center, Sun., Nov. 5 at 2 pm and 7 pm, Sun., Nov. 12 at 5:30 pm, and Sat., Nov. 18 at 2 pm and 8 pm. This masterwork of Latin American theatre, marvelously performed, should not be missed!